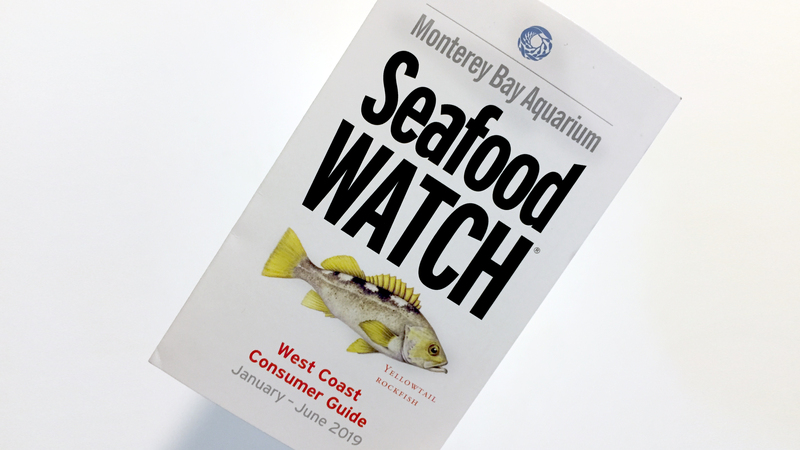 Seafood Watch may be most well known for it's pocket-sized consumer guides. The Monterey Bay Aquarium Seafood Watch program helps consumers and businesses choose seafood that's fished or farmed in ways that support a healthy ocean. 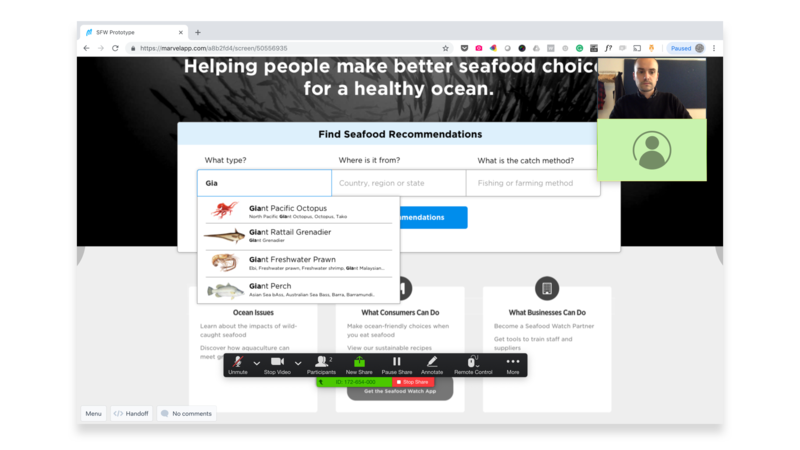 How might Seafood Watch improve the user experience of their website so that business and restaurant partners can find and discover recommendations in a way that meets their unique needs? 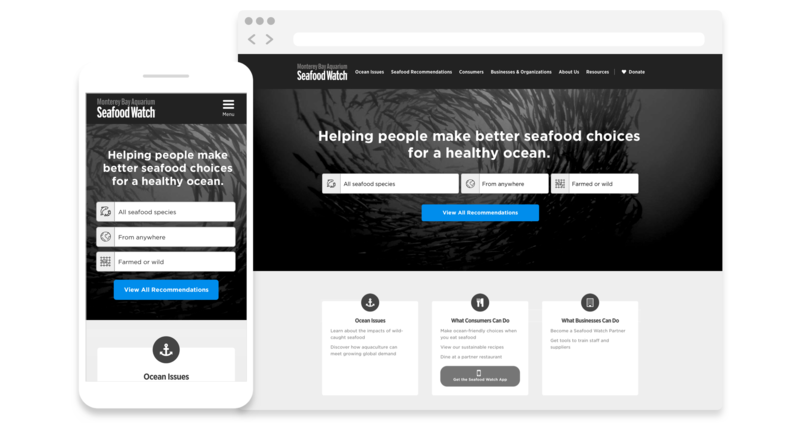 By redesigning the search experience more specifically for businesses and restaurants, Seafood Watch can empower business partners to make more actionable and effective decisions regarding sustainable seafood and, in doing so, improve their impact on the industry. 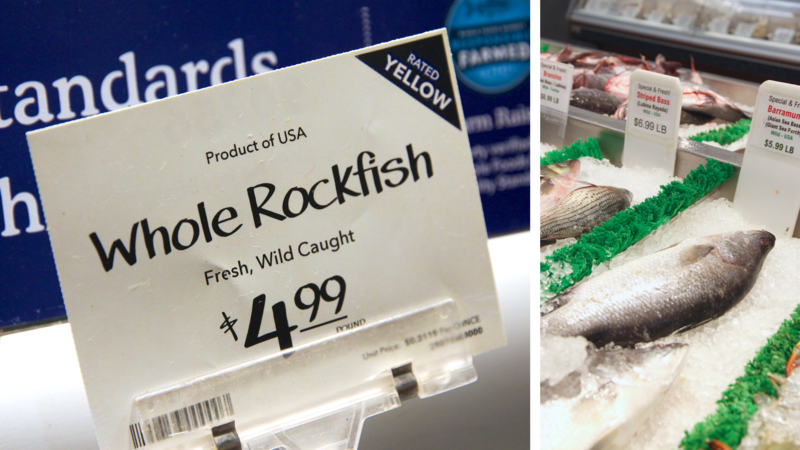 Our research process included intercept interviews with employees and shoppers at Whole Foods, one of Seafood Watch's partners. Our Discovery phase sought to better understand the unique needs of Seafood Watch’s business and restaurant partners as they relate to the Seafood Watch website and, more specifically, the recommendations search function. Through in-depth interviews with chefs, fishmongers, managers and influencers, we uncovered insights and opportunity areas that helped us create strategic approaches for how businesses find seafood recommendations online. We tested medium-fidelity prototypes with interactive wireframes built in Marvel. 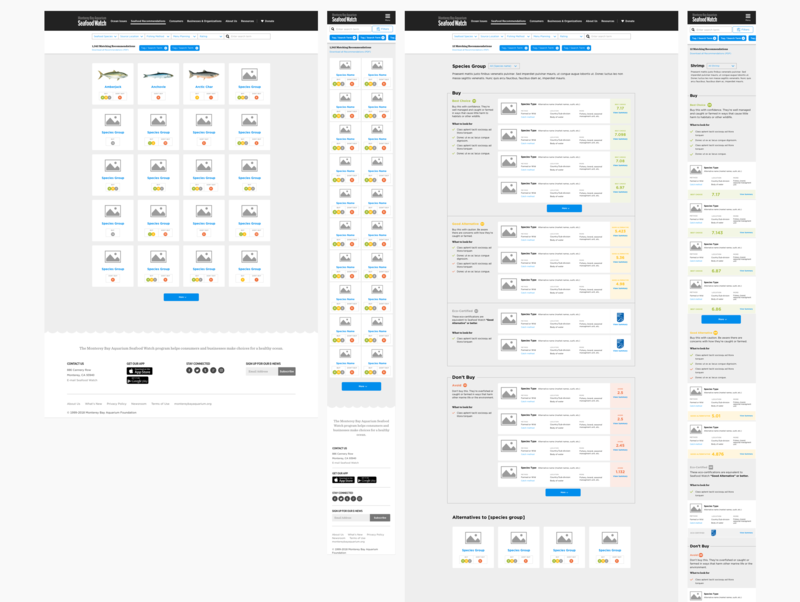 We tested two concepts using medium-fidelity prototypes in the form of interactive wireframes. The purpose of this testing was to collect feedback on specific recommendations while also soliciting new ideas from our target audience. Prototype testing was conducted remotely using Marvel. A final report with fully documented wireframes was presented to Seafood Watch who are in the process of redesigning their entire website. Based on feedback from prototyping testing and ongoing collaboration with the Seafood Watch team, we handed off fully documented responsive wireframes for 4 templates and an updated interactive prototype built with Marvel. As the Monterey Bay Aquarium and Seafood Watch overhaul their websites, these design will serve as a valuable inputs for how they prioritize and implement a business-focused search experience. As the lead researcher and designer, I led the audience research, prototype testing and UX design. I was supported by an Account Director and Account Coordinator from Blue State Digital.